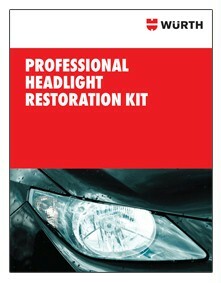 Enhance your CSI by refinishing instead of replacing headlamps. Let a trained WURTH USA representative show you how to improve your customers' safety while increasing your profit by $50 or more per repair order. Your employees will learn how to prepare the area for refinish, how to properly protect the surrounding area from polishing material and waste, and proper polishing and finishing procedures. For more information, contact your WURTH Sales Rep or call 800-987-8487.